Much nicer than the church basement, at least during a Seattle summer — and better attended, too. Photos courtesy SDOT. No time to invite the neighborhood to your project’s open house? This week Seattle brought the open house to the neighborhood instead. No walls: now that’s transparency in local government. 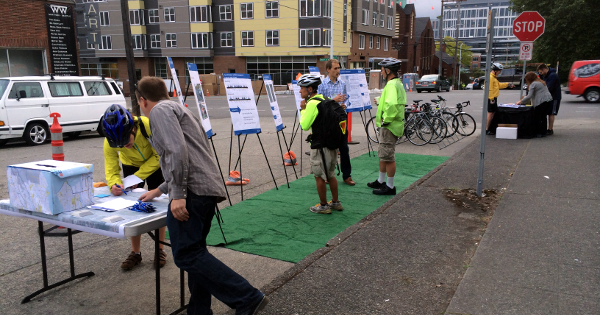 One part public outreach and one part PARK(ing) Day, the city’s three-hour open house Wednesday for its half-mile protected bike lane on Dexter Avenue took place on green plastic mats spread out to cover an empty parking space. Project manager Kyle Rowe explained Thursday that a different, state-led project on Dexter had him on a tight deadline. 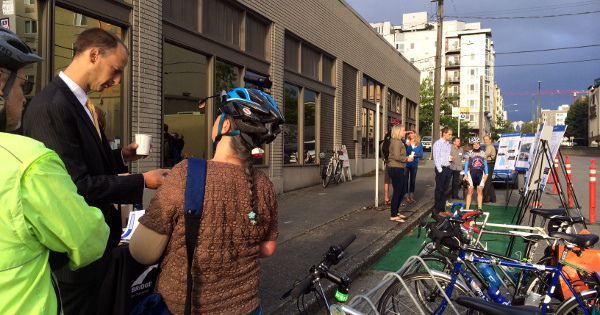 What’s more, because Dexter is a necessary link between downtown and the heart of Seattle’s bike culture in Fremont and Ballard, the number of affected households was huge. 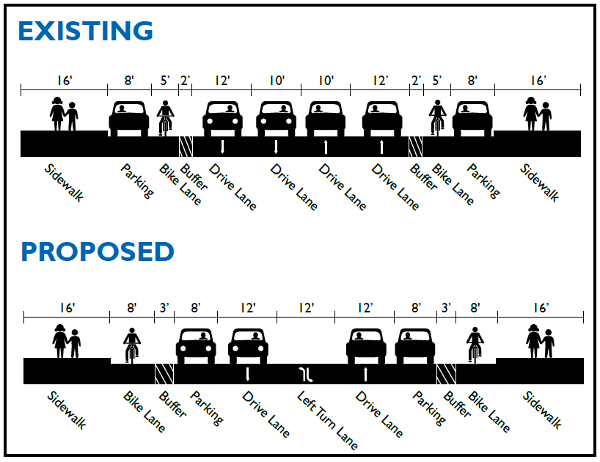 The project is a standard 4-3 road diet, plus switching auto parking and bike lanes to create narrower street crossings and a much more comfortable bike ride. So Rowe used a trick he said he’d seen on “Streetblog or CityLab” and held his public meeting on the side of the street from 7 to 10 a.m. on a weekday. He brought eight easels, two tables, a few temporary bike racks, a comment box, sticky notes, a sign-in sheet and a bunch of hot coffee. That last item was important. “I think the coffee was the big sell, but it definitely allowed us to get five minutes with them,” he said. Seattle Transportation Director Scott Kubly talks with residents about the plan. The open house drew 40 to 60 people, Rowe estimated: people passing by, working or just walking in the area. It cost exactly as much in staff time as a traditional evening open house. And unlike an indoor meeting space, the street use permit was free. Rowe said almost all the responses were positive, though some people had requests for changes to crosswalks. New Seattle Transportation Director Scott Kubly stopped by, arriving on his own bike. So did more than one local TV station, but Rowe said he doesn’t think the TV stations ever broadcast anything. “Maybe there wasn’t enough controversy,” he said.